The HTC Desire 816 has a 13MP camera. Instead of a low-resolution UltraPixel sensor HTC went with a more traditional BSI sensor with a 28mm lens (in 35mm equivalent) and f/2.2 aperture. It's a 4:3 sensor too, meaning you lose some resolution when taking 16:9 shots. This camera is not backed by an ImageChip so a handful of options are missing (Zoe mode most notably). It does have HDR, Panorama (with a digital horizon level), geo-tagging and image effects. The settings are hidden by default, but you can control ISO, exposure compensation, white balance and image adjustments. 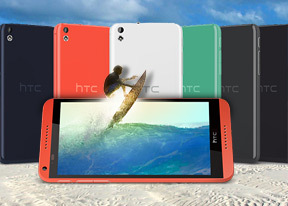 The HTC Desire 816 has a 5MP front-facing camera with a BSI sensor and a dedicated selfie mode. From the settings you can enable smile shutter and adjust the Make-up level, which tries to digitally pretty you up. The Desire 816 camera produces surprisingly good photos. In fact, they are unlike anything we've seen from an HTC phone. It's a clear departure from the image processing of old. HTC has finally nailed it. The photos produced by this 13MP camera may not be the sharpest or the noiseless ones we've seen, but they exhibit extremely well-tuned rendering. The image processing is so mature that it's like HTC has brought somebody from the iPhone's team to work on the software side of things. We are pretty sure it's also not a one-off streak of luck. Our time with the latest HTC One mini 2, which has an identically spec'd camera, show more of the same thing. It's as if both use the same camera module and processing settings. We are more than pleased with the way the camera picks exposure and colors, even in mixed light. Digital noise is visible but it's not that obvious as it takes the form of only luminance noise. There are no color blotches. There's equal sharpness edge to edge and there are no noticeable lens issues. The white balance is sometimes a bit too warm but some people like it that way. This is the camera we would have expected to see from the HTC One flagship last year. It's a pity to see it come at a so late point in time. The HTC Desire 816 has one really nice camera. The only downside is that it tends to pick a warmer white balance to most photos, which results in a yellowish tint, which is noticeable on our sample images, and especially the first chart. Here, in our photo quality compare tool you can see how it stacks up against competing phablets like the Samsung Galaxy Note 3 Neo (8MP) and the Sony Xperia T2 Ultra (13MP) by following the links below. The Desire 816 shoots 1080p videos at 30fps, though there's also a 60fps mode at 720p. The front-facing camera can also record 1080p videos. Other options include slow-motion video, image effects and settings for ISO, exposure compensation and white balance. The 1080p footage quality is markedly better than anything HTC had so far in the Desire lineup. We can probably say it's on par with what the HTC One mini produces, but the level of resolved details falls short of reaching the original HTC One or the One (M8). Another thing to note is that the colors seems a bit oversaturated, but oftentimes it's how users prefer them. The 1080p have a 20Mbps bitrate and the audio is recorded in stereo with a bitrate of 192kbps. Here, have a look at a sample, which we've uploaded on YouTube. You can also download an untouched video sample - 0:08s, 20.1MB. HTC is no longer the underdog in the camera race. Even the midrange Desire 816 fares quite well when compared to identically price phablets, as you can see in our Video comparison tool. Unfortunately, the oversaturation of colors and the slight yellow tint that we saw in the still photos, is visible in the videos as well.